Even though it was a cold night in Meridell, Miraja just couldn't sleep. The Striped Xweetok Dancer just felt anxious – there hadn't been any real battles in Neopia for over two years, when Faerieland fell. And to tell the truth, as horrible as it made her feel, Miraja was getting bored without any arch-villains to fight. Oh, sure, sometimes she'd sneak out of her home and catch some Thieves' Guild thugs, but it wasn't the same when there wasn't some diabolical mastermind behind things. Miraja sighed, her long pink hair flowing in the winter wind as she sat on the roof to the house she lived in with her three best friends. "What happens to be the problem, dear?" In a flash of purple runes, Ashlynne, the Darigan Aisha Sorceress, and Miraja's friend, appeared on the roof. "I saw you climb out of your window in your pyjamas." She sat down next to Miraja, her crimson robe rustling in the wind and her magic staff hovering by her side. "I'm bored. That's all there is to it." Miraja leaned her head back against the snow on the roof. "No undead pirate captains, no crazed warlocks, no evil overlords... Not even a single crooked advisor's shown up for two years! Well, other than Advisor Broo, but he never DOES anything!" Ashlynne frowned and lied down next to Miraja, her silvery hair brushing against the snow. "Well, there was that time Krawk Island was torn into pieces by a Krawken..."
"Psht," Miraja huffed. "That over-sized calamari was scared away by a cannonball that didn't even hit it." Ashlynne pondered another incident that had happened in the past few years. "There was that Neggbreaker beast that some unlucky fools accidentally freed." "Yeah, he went down like a wimp." Miraja rolled her eyes. "All we needed was an amulet!" Ashlynne frowned again. "Erm, there was also the time Roo Island was over-run by Petpetpets?" "Ew, don't even bring that up!" Miraja shuddered – she still remembered feeling the "ground" crawl beneath her feet. "Besides, they were just bugs. I want to fight something big and nasty, like a Snowbeast or the Monoceraptor!" "Well..." Ashlynne grinned a bit. "We could always go over to Neopia Central and see if the Defenders need some help." Miraja rolled her eyes and laughed. "You mean the Defenders who always end up needing their skins saved by non-superheroes? They need all the help they can get!" Miraja leapt back into her room through the window and, quick as a wink, changed into her battle attire and leapt out the window onto the ground. "You coming, Ash?" "Of course I am." Ashlynne closed her eyes and teleported next to her friend. "You mind if we take a shortcut?" Miraja shrugged. "Sure, I guess." Ashlynne took Miraja's hand and began chanting a spell that would teleport them all the way to Defenders HQ. Upon arrival, the two of them glanced around at the apparently empty HQ. "Why aren't there more Neopians around here?" Miraja raised an eyebrow as she started to walk towards the towering doors. "Well, the Defenders have had to learn the ropes of the new Battledome system, it seems." Ashlynne shrugged. "It's strange, since fighting's always been the same for us." The two heroines walked into the hallway of the HQ, a blue Chia stretched out from behind the statue of Judge Hog. "Excuse me, do you two have official Defenders business?" His body then stretched over to follow him, and he assumed a natural Chia shape. "Did someone steal your favorite grooming tools?" Miraja shot him a look. "No, we're here to see if any of you guys need someone to sort out a problem for you. Want a demonstration?" Dr. Flexo raised an eyebrow. "Sure, I suppose." Miraja smiled, and she cartwheeled into the center of the room. After drawing her metal fans from her obi sash, she struck a pose as if she was dancing before engaging in all sorts of acrobatic maneuvers, her metal fans sending out powerful gusts of wind with each graceful step and flip. She then pirouetted in place and generated a whirlwind, before dissipating it with a single motion. "How's that?" "Hmmm, not bad. Not bad at all." Dr. Flexo smiled. "As for you...?" He hesitantly looked up towards Ashlynne. "I understand if you're afraid." Ashlynne smiled. "Us Darigani are a bit intimidating to look at, but I assure you that I'm just as good in a scrap as my friend." Ashlynne teleported to the center of the room. After a brief chant, she began casting various spells from her staff – magic lightning arced around the room, as a circle of runes appeared around her feet. To finish off the light show, she combined all the lightning into a massive spiral of runic energy, and then tapped her staff on the floor to cause it to dissipate. Dr. Flexo was so impressed, that he enlarged his hands so his claps would be louder. "Good show! Are you two seeking positions with the Defenders, or are you just doing mercenary work?" "Well, we are mercenaries whenever Hunter's not around, so..." Miraja laughed, baring a fang in the corner of her mouth. "Whichever job pays the most, we'll do!" "All right, then." Dr. Flexo smiled as he stretched over to the computer terminal. "It says here that there's been some trouble over on Krawk Island. Looks like our old 'friend' Lady Frostbite has decided to pay a visit to Mystery Island. Find him and put a stop to whatever she's doing." Miraja and Ashlynne both nodded, and stepped into a portal to Mystery Island. As the two of them stepped out of the portal, they noticed a chill in the air. "Brrr, it's even colder than it was back home!" Miraja shuddered and crossed her arms. "Odd." Ashlynne placed her claw on her chin. "Even for this season, it's unusually cold. Especially considering how there's snow in the air..." Ashlynne closed her eyes for a second. "I'm guessing this is Lady Frostbite's handiwork." "Gee, y-you think?" Miraja's teeth were chattering even as she leaped up a tree. "Th-there's no sign of her anywhere... And how come you aren't sh-shivering?" "Oh, that? I cast Endure Elements on myself. It's a pretty basic spell, actually-"
"Well, could you cast it on me?!" Miraja shouted. "Oh! Of course, love." Ashlynne chanted a few words and within seconds Miraja felt like it was a nice Spring day. "Thanks, Ash!" Miraja smiled and climbed further up a baobab tree. "I think I can see where she is from up here!" Without a sound, Ashlynne teleported up to the branch Miraja was standing on. "Hmm, it does look like her, what with the gigantic mohawk and being surrounded by Darblats and all..."
Miraja smirked. "Let's get the jump on her!" Miraja leaped out of the tree, drew her tessen, and dashed towards the frozen village. Lady Frostbite tapped her hind claw on the frozen sand furiously gesturing towards one of her Darblat minions. "Gunter, what are you doin'? Hurry it up – we gotta make sure all we got that ice wall so those blasted ninjas don't try anyth-OOF!" Lady Frostbite was sent hurtling into a frosty palm tree, and a pile of snow fell on top of her. "Didn't see that kick coming, did you?" Miraja struck a triumphant pose and smirked. " Now, do you want to surrender, or are we gonna have some fun?" "Surrender?" Frostbite dug her way out of the snow, icy vapor materializing around her scepter. "Not unless you FREEZE!" She aimed the scepter at Miraja and sent a blast of ice magic at the Xweetok, who nimbly dodged the blow... Well, mostly. "Why aren't I moving as fast... H-hey! My leg's frozen in a block of ice!" Miraja began furiously striking the ice around her leg with her fans, chipping off bits and pieces. "Now this time, you better hold still, or I'll" Lady Frostbite's aim was disrupted as a Darblade pulled on her tail, frantically gesturing behind her. "Gunther, stop bothering me! I'm in the middle of making a Xweetoksic-AGH! HOT! TOO HOT!" The icy Krawk ran around, trying to extinguish the inferno raging in her mohawk. Ashlynne twirled her staff around and blew on the end. "Ah, Fireballs. Is there nothing you can't solve?" Ashlynne then cast another fireball towards Miraja and thawed out her leg. "I suppose we should finish her, eh, dear?" "You got it, Ash! I need some payback!" Miraja dashed around the battlefield, gathering the wind with her tessen before unleashing a hurricane-force wind at Lady Frostbite. "WHAT ARE YOU BIRDBRAINS DOING?!" Lady Frostbite, now stranded on top of a palm tree without her scepter, screamed orders at her Darblat minions. "MAKE SURE THEY DON'T FIND THE ICE MACHI-"
"Oh, this little thing?" Ashlynne fried the giant ice machine with a bolt of lightning. "It looks like its warranty's up." After quickly climbing up the tree and tying up Frostbite, Miraja handed her over to Ashlynne, who teleported her over to the Defenders base. "So... Wanna go get our reward now, Ash?" "I don't know..." Ashlynne pondered. "The weather's getting nice and warm again. I think we should have a little vacation here and go back home sometime tomorrow." "Yeah, forget the reward." Miraja sighed and laid back in the thawed out sand. "I think a nice trip to Mystery Island's all the reward I wanted. I'm exhausted..." The Xweetok closed her eyes, lulled to sleep by the rolling waves. Ashlynne smiled a little, and conjured up towels beneath her and Miraja so sand wouldn't get all over them. "I suppose we earned this rest." She laid down on her towel and fell asleep, dreaming of the next time she and Miraja could have a girl's night like this. General Knowledge: Pet and Petpet Spotlights! 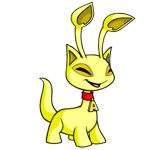 To date one of my pets has one the Pet Spotlight and four petpets have won the Petpet Spotlight. Now, I aim to transfer my general knowledge onto you Neopian Times readers. 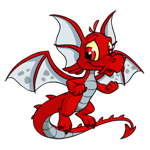 When I hatched in the Draik Nest, I was all alone.